Before we get started, watch this video and introduce yourself to sentence fragments. "Hey, Sam, do you want to get some lunch?" "I can't. Too much homework to finish before class." "I can't. I have too much homework to finish before class." 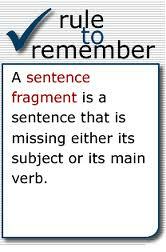 Learning how we use fragments in our speech will help us avoid sentence fragments in our writing. But how we spot a sentence fragment? Does it have a verb? Does it have a subject? 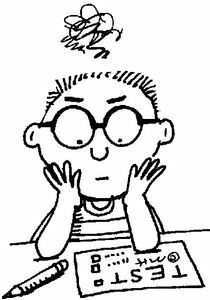 Can the phrase make sense standing alone (is it a dependent clause or phrase)? Any phrase that answers "yes" to all three questions is a sentence. If any of the answers are "no," then it is a fragment. Click here for a great review! Before we go any further, take this quiz to test your skills! Still not doing so well? 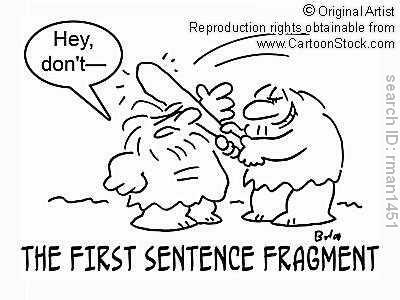 Click here for another great review of fragment sentences. CCSS.ELA-Literacy.L.4.1 Demonstrate command of the conventions of standard English grammar and usage when writing or speaking. CCSS.ELA-Literacy.L.4.1f Produce complete sentences, recognizing and correcting inappropriate fragments and run-ons.